The Bowie-esque dance-pop of Itchy Revolutions' "Face Me", the pulsating electronics dance-funk of The Faint's "Your Retro Career Melted (Ursula 1000 Remix)", or the hip-hop of i:cube (featuring RZA) on "Can You Deal With That". Then there is !!! 's "Me & Giuliani by the Schoolyard (A True Story)", a dance club-meets-electronic-indie-rock number. Or Elefant's "Bokkie", a melodic, guitar-driven, danceable indie rock song. These are what you will find on The Sound of Young New York II, a record sure to make everyone in Williamsburg or L-train riding, overly tight thrift store clothes wearing boys and girls in New York wet. 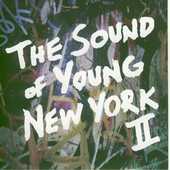 Still, despite its overly indie cool tones, The Sound of Young New York II (aptly titled, I might add), has a lot of good music, and a lot of it highly danceable and perfect to party too. So, bring it to your hipster friend's house and impress. I'll give it a B-.